Many power supplies fail to obtain the 80-Plus certification, which indicates that the power supply can provide 80% plus power efficiency. The ZP series, however, can. 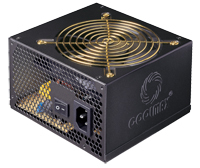 It is one of the few power supplies that can give you the power you need at higher efficiency, which means you can use the same power with less energy. It is also built with a 120mm fan that maximizes its cooling system and Active PFC to improve the stability and efficiency of the transmission network. APFC will help reduce transmission loss and improves voltage regulation. Save money at high power efficiency with ZP.